William R. "Bob" Dickie, Chief Electrician's Mate, born Dec. 4, 1922, Newburyport, MA, graduated high school; attended Naval Electrical School at San Diego Radar School at Philadelphia; and received his associate degree, Massachusetts Criminal Justice Police Academy. 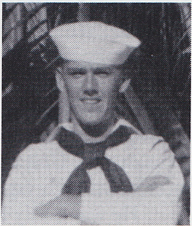 He enlisted in the USN Dec. 6, 1940; attended boot camp at Newport, RI; Group 1, Class A, Electrical School, San Diego. Military stations were the USS West Virginia (BB-48); USS New Orleans (CA-32); USS Delta (AR-9); USS Oahu (ARG-5); USS Oklahoma City (CL-91). Decorations include the American Defense, Asiatic-Pacific, American Area, EAME, Good Conduct, WWII Victory and Purple Heart. Memorable experiences were of swinging his hammock on the square rigger USS Constellation; the Pearl Harbor attack; early battles in the Pacific; crossing the Atlantic during the worst of the U-boat wolf packs; bombing by Italian and Germans in the Mediterranean; shelling of Nojima Cape in Tokyo Bay on the night of July 18, 1945; going around Hiroshima in a borrowed Army truck; and going under the Golden Gate Bridge. Discharged Dec. 14, 1946, with the rank of chief electrician's mate. Married on Aug. 17, 1947, and has three children and three grandchildren. He became a FCC licensed radio engineer and retired from New England Power Company. He went through the Police Academy and was appointed Harbor Master for the town. He holds the amateur radio call, K1WOC.